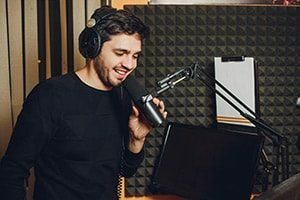 For over 36 years, the Academy of Radio and Television Broadcasting has trained thousands of people just like you who are now working in the broadcasting industry. We are a nationally accredited school that provides you with the skills you need for an exciting career in Radio and Television Production. Graduate in months, not years, learning on industry equipment and producing air-quality shows. You are coached one-on-one with working Radio and Television Production professionals, not just instructors. Learn at your best in a hands-on program that makes you feel like you’re actually on the job! Academy graduates are working as On-Air Personalities, Newscasters, Sports Reporters, Podcasters, Internet Radio Station Operators and Hosts, Producers, Promotion Directors, Voice-Over Artists, also as on Camera News and Entertainment Reporters, Camera Operators, Digital Video Editors, Commercial Producers and Production Assistants and Directors. What will you become? Explore our programs below and discover the broadcasting path that’s right for you. Classes starting in less than 3 weeks! 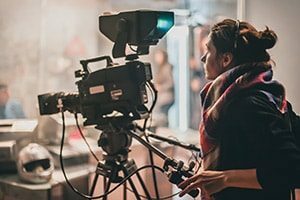 Get a competitive edge entering the TV Broadcasting Industry with on-camera and off-camera experience working with real industry equipment. Build your portfolio producing a variety of shows, and feel confident entering a career in traditional or online video. Learn more. Become an engaging radio personality or behind-the-scenes production professional with our on-site radio program. Build on-air and off-air experience using a variety of industry-standard equipment to produce your own shows, all while being guided by industry-experienced mentors. Get the skills you need to become a confident Radio Broadcaster. Learn more. 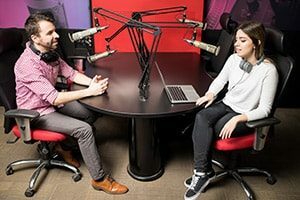 Get the skills you need to become a professional Radio Broadcaster or Podcaster right from your laptop. Produce your own shows in your digital radio studio and be guided by one-on-one mentorship with our industry-experienced instructors. Turn your passion for offline or online radio into flexible career from the comfort of your own home. Learn more. The Academy of Radio Broadcasting has been approved to operate by The Bureau for Private Postsecondary and Vocational Education under the California Education Code Section 94915. Approval to operate means that The Academy is in compliance with the minimum state standards and does not imply any endorsement or recommendation by the state or by The Bureau. The educational program offered by The Academy is validated by the Accrediting Commission of the Accrediting Council for Continuing Education and Training (ACCET), a national accrediting agency listed with the U.S. Department of Education. These accreditations and approvals ensure that you will receive high-quality training that meets their requirements and expectations. We provide the most job-focused, intensive broadcast training that’s around. Not only that, but we get you the skills in a fraction of the time compared to larger institutions, all while delivering the best possible learning environment. Real-World Training – Our Programs are designed to simulate actual broadcast studios as much as possible. No matter if you are training on-campus or from your digital radio studio, the projects you’ll create will feel like actual job assignments and can be used in your professional portfolio as you move into your career. One-On-One Coaching With Industry-Experienced Instructors– From day one until graduation, you will be guided by your own coach who will critique your work and provide meaningful advice you as you build your broadcasting skillset. Pursue your career with confidence knowing your work has been approved by actual broadcasting professionals. Fully-Equipped Studios – Learn on the equipment used in the real world. You will spend almost 90% of your time training hands-on in professional studios and utilizing state-of-the-art technology. Job Placement Assistance – Graduates will be helped by our full time guidance staff to help you get your foot in the door. The Academy has 36 years of career guidance success, and as such, we have an established network of job leads and industry contacts. We take pride in our Veteran students and graduates and honor their service to our country. We are proud to accept the Post 9/11 GI Bill in all of our programs. Enter an exciting civilian career that highlights your creativity and passion for media, all while receiving the up-to-date skills and mentorship you need to succeed. Your GI Bill will cover all Academy costs. We have trained thousands of aspiring broadcast professionals like you for over 36 years. Our modern, digital studio and instructor’s real-world experience will fully prepare you for a variety of careers in the industry. Learn more about the admissions process, tuition fees, and other course requirements here. Our Admissions team would also be happy to answer any questions you may have by completing this form. We are a fully-accredited Title IV school and we accept both Federal Aid and Veteran’s Benefits. Our knowledgeable financial aid advisers will work with you to make your broadcasting dreams affordable. The mission of The Academy of Radio & TV Broadcasting is to provide those with a sincere desire for careers in Radio and Television/Video Production with their best opportunity for entry-level positions in the Industry. The Academy accomplishes our mission by screening applicants for talent and desire, and providing complete, comprehensive training in a hands-on environment, coaching by working professionals, and mentoring on an individual basis. Many of our hard-working graduates have found their dream jobs through training at the Academy. Thanks to a level of hands-on training and resume experience that can’t be matched by traditional university programs, they got the skills they needed to get to where they want to be. No matter if you want to watch sports for a living, become a camera operator or let your personality shine on-air, we could help you build the skillset you need to succeed in broadcasting.